(Bloomberg) -- Electoral defeat in Istanbul is hard to stomach for Turkey's ruling AK Party, and it shows in the streets. Giant AK Party banners thanking voters in the metropolis have been rolled out across various locations to adorn walls and overpasses. Which is strange, because it seems to have lost the vote. 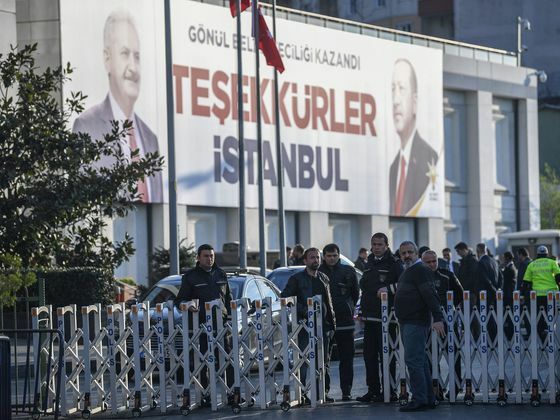 The posters, which sport photos of President Recep Tayyip Erdogan along with the candidate, Binali Yildirim, a former prime minister, have been widely shared on social media including by the opposition candidate who ended up in front when the votes were counted, Ekrem Imamoglu. Yildirim prematurely declared victory on the night of the election, but was forced to admit a day later that he was trailing by some 25,000 votes when all were tallied. Still, two days later, neither he nor Erdogan have conceded defeat, and the government's high elections board hasn't published final results to make the change of power official. In the background is an effort by Erdogan’s camp to recount more than 300,000 illegible votes that's putting the opposition – and investors – on edge. AK Party's victory posters are compounding the unease. It was a close race, which Imamoglu won with 48.79 percent of the vote, according to the tally by the state-run Anadolu Agency, based on data from the elections board. Yildirim came second, with 48.52 percent. Hints of one possible explanation for the banners could be gleaned from Erdogan’s speech after the vote, where he fell short of declaring victory, like Yildirim had, but spun the results as a partial success because the party picked up district seats even in cities where it lost the mayoral race. In Istanbul, AK Party won 24 of 39 districts. But it’s unclear why the party chose to roll out “thank you” posters with the losing candidate. Erdogan’s ascent to power started when he became Istanbul mayor in 1994. His party has been ruling the nation’s commercial capital ever since. A spokesman for the Istanbul Greater Municipality didn’t respond to calls to his mobile phone. Calls to the municipality’s public relations department were diverted to a fax machine.